These simple slide creation tools work seamlessly with Markdown, letting you add pizzazz to your next presentation. Vector Open Stock. CC BY-SA 3.0. Imagine you've been tapped to give a presentation. As you're preparing your talk, you think, "I should whip up a few slides." Maybe you prefer the simplicity of plain text, or maybe you think software like LibreOffice Writer is overkill for what you need to do. Or perhaps you just want to embrace your inner geek. It's easy to turn files formatted with Markdown into attractive presentation slides. Here are four tools that can do help you do the job. 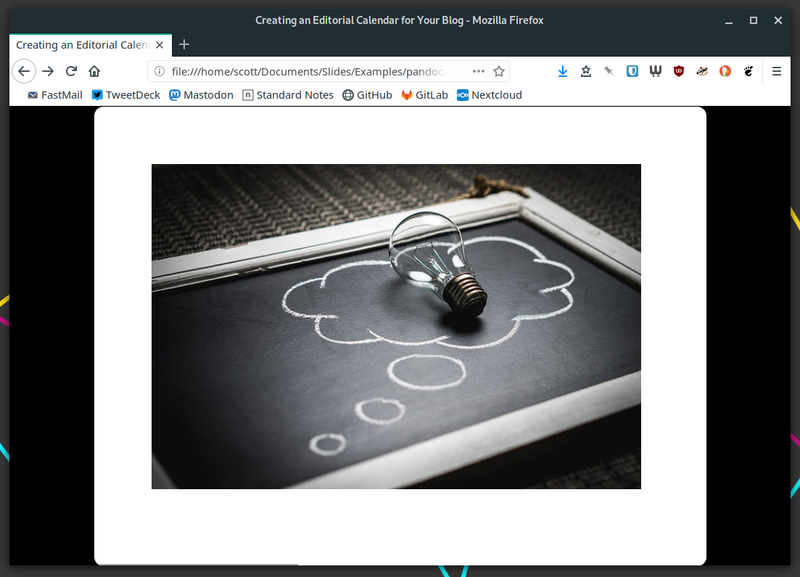 One of the more flexible applications on this list, Landslide is a command-line application that takes files formatted with Markdown, reStructuredText, or Textile and converts them into an HTML file based on Google’s HTML5 slides template. All you need to do is write up your slides with Markdown, crack open a terminal window, and run the command landslide followed by the name of the file. Landslide will spit out presentation.html, which you can open in any web browser. Simple, isn’t it? Don't let that simplicity fool you. Landslide offers more than a few useful features, such as the ability to add notes and create configuration files for your slides. Why would you want to do that? According to Landslide's developer, it helps with aggregating and reusing source directories across presentations. Marp is a work in progress, but it shows promise. 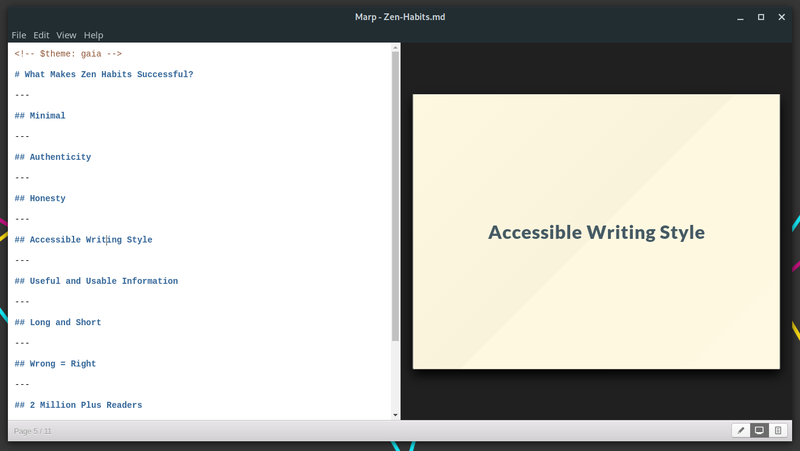 Short for "Markdown Presentation Writer," Marp is an Electron app in which you craft slides using a simple two-pane editor: Write in Markdown in the left pane and you get a preview in the right pane. Marp supports GitHub Flavored Markdown. If you need a quick tutorial on using GitHub Flavored Markdown to write slides, check out the sample presentation. It's a bit more flexible than baseline Markdown. While Marp comes with only two very basic themes, you can add background images to your slides, resize them, and include math. On the down side, it currently lets you export your slides only as PDF files. To be honest, I wonder why HTML export wasn’t a feature from day one. You probably know pandoc as a magic wand for converting between various markup languages. What you might not know is that pandoc can take a file formatted with Markdown and create attractive HTML slides that work with the Slidy, Slideous, DZSlides, S5, and Reveal.js presentation frameworks. If you prefer LaTeX, you can also output PDF slides using the Beamer package. You'll need to use specific formatting for your slides, but you can add some variables to control how they behave. You can also change the look and feel of your slides, add pauses between slides, and include speaker notes. Of course, you must have the supporting files for your preferred presentation framework installed on your computer. Pandoc spits out only the raw slide file. Hacker Slides is an application for Sandstorm and Sandstorm Oasis that mates Markdown and the Reveal.js slide framework. The slides are simple, but they can be visually striking. Craft your slide deck in a two-pane editor in your browser—type in Markdown on the left and see it rendered on the right. When you're ready to present, you can do it from within Sandstorm or get a link that you can share with others to present remotely. What’s that—you say that you don’t use Sandstorm or Sandstorm Oasis? No worries.There's a version of Hacker Slides that you can run on your desktop or server. If you use Jupyter Notebooks (see community moderator Don Watkins' article) to publish data or instructional texts, then Jupyter2slides is for you. 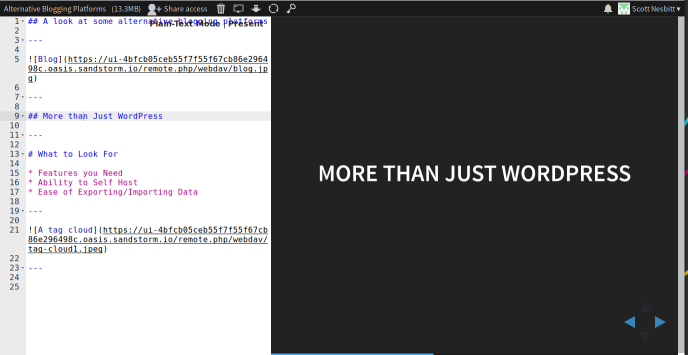 It works with Reveal.js to convert a notebook into a nice set of HTML slides. If you prefer your applications hosted, test-drive GitPitch. It works with GitHub, GitLab, and Bitbucket. Just push the source files for your slides to a repository on one of those services, point GitPitch to that repository, and your slides are ready to view at the GitPitch site. Do you have a favorite Markdown-powered slide generator? Share it by leaving a comment. Great article. You've provided me with some new tools to explore. Thanks for this list, several of the tools seem very useful. I would add one tool not dedicated to presentation but really amazing: org-mode (https://orgmode.org/). It enables markup writing and exports to various formats such as latex beamer for presentation. After years of using this emacs mode for self organization and document drafting I would recommend its exploration. This was covered a few months ago in this article. Thanks Scott, I hadn't seen your post, a good complement to this one. 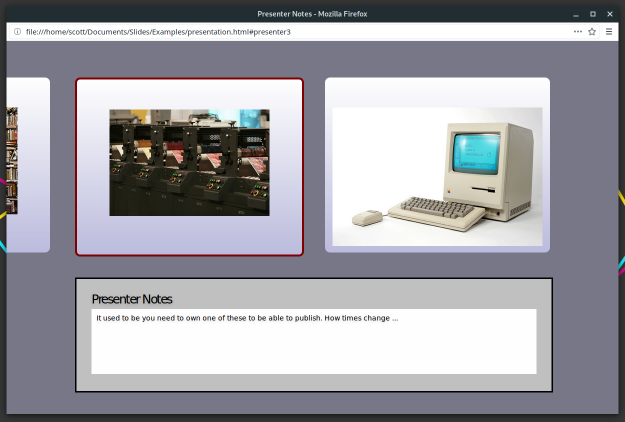 My first choice for presentations is org-mode export to beamer but I will probably try with reveal.js soon.